Yeah, no .45, no .40, no 10mm. On the other hand, this still gives me chub. 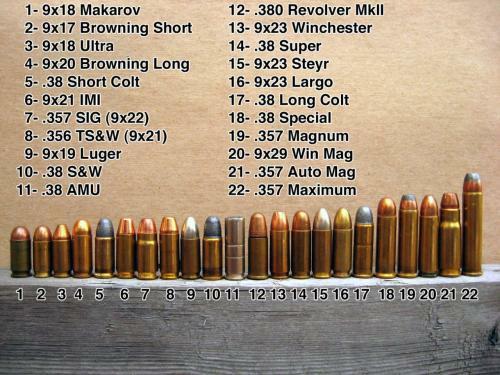 I’d love to see one of these comparing these with the likes of the .45ACP .454Casull and .50AE..
Actually I think the .50AE is comparable in height to the .357Max, though it’s much wider. It does dominate every other handgun round here though. Actually there are quite a few more, too. What’s more is that the picture never said anything about only showing handgun rounds. LOL. And it’s the .50 BMG that’s the king of the jungle…. Actually, I think all of the rounds shown here actually just happen to be handgun rounds. I’ll admit it’s humorous, but dang…! ROFLMAO! Not unfair at all… Once in a while, a Marine sniper, using an M106, or other variation of the Barrett .50cal sniper rifle, plinks off a turd carrying only a handgun. You pro troll you, the AK-47 fires a 7.62mm round.